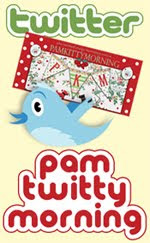 PamKittyMorning: Great Granny with a Twist! Good morning! 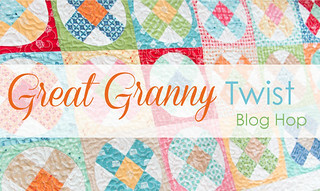 Happy Friday and hello from the last day of the Great Granny Twist Blog Hop with Fat Quarter Shop and Lori Holt! It's been a fantastic week of clever people using the Great Granny Squared book as a jumping off point for new and exciting projects! When Daniar from Fat Quarter Shop first asked me to play along, I didn't think I could think of anything new and fresh. But my friend Greg had a pile of great ideas and he inspired me to think about it some more. It didn't hurt that Daniar was persuasive! Fat Quarter Shop has a wonderful staff. 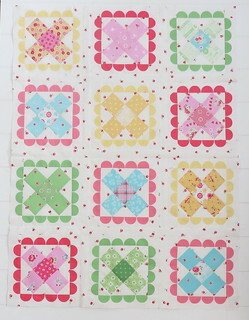 I pulled out my PamKitty stash and got busy making the mama blocks blocks from the Bonus Quilt in the book. I like their size and the method to make them. The block floats, so there is some wiggle room in the finished size, and I was sure I could use that to my advantage. Taa Daa... Mama's Doily blocks! I trimmed my blocks to 6 1/4 inches and added scallops from Holly's scallop stripes fabric. 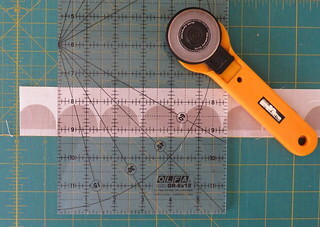 I cut the strips apart then counted over 3 scallops, and measured 3 1/8 inches to the right, cut, and then cut 3 1/8 inches to the left, and ended up with the 6 1/4 inch strip I needed to frame the blocks. You can see below I'm set to cut the right hand side. The waste is minimal. Egads, totally addictive. I had planned on just a small 3 block runner, but I couldn't stop making the blocks. I whipped up a couple of Fog City Kitty blocks to test out my quilting idea. 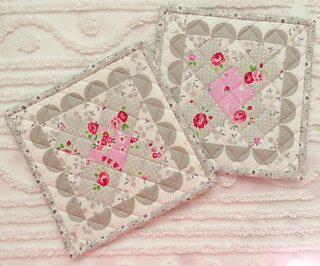 I love grid quilting and for my two-too-pretty-to-use potholders, it's perfect. But on the whole quilt? Not sure. Well that's a problem for FuturePam to worry about. No time for quilting now! 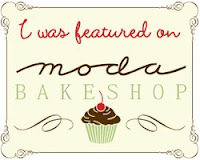 Thanks to Fat Quarter Shop for including me in on this project! And thanks to Daniar and Greg for the extra encouragement. Holy cow though people, kid stuff compared to all the wonderful projects made by the other people on the list. Be sure and check out all the projects. I really love all the wonderful photography out there. Ohmygosh. I can't stop looking! And while you're at it, check out the great video from Fat Quarter Shop on how to make their Great Granny Circled Quilt! Super cute! What a pretty twist to these blocks. Love the scallops you put around them all. Beautiful! Love your little pot holders - yes too pretty to use! Absolutely darling! Love those scallops. These may just be my favorite! I am off to buy some scallops! 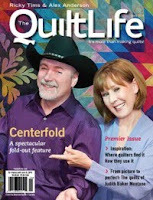 You quilters are so clever and awesome. 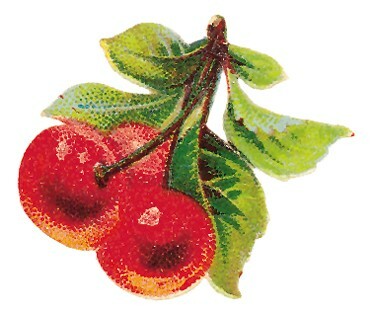 Now I just want to get busy making my own pretty projects from Lori's book. Thanks a million! Thanks for taking your turn...so cute as usual! 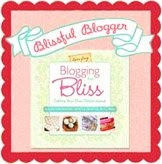 Love your block and the fabric! Oh PKM -- those blocks are just toooo cute! I love the sweet scallops!!! Oh Pam, they turned out fabulous! 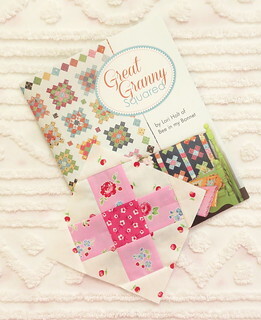 The scallops were just perfect for the Great Granny blocks! I love your blocks. They are adorable!! 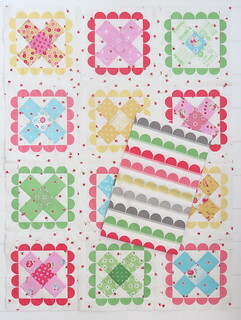 I am almost finished with using your Pam Kitty fabric for Lori Holt's Great Granny Squared. 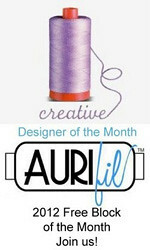 Can you tell me which solid color fabrics would go with your line of fabrics. I have a ton of it left and what to make something else with the strips. 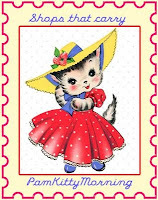 However I do not have a quilting store near me so all shopping for fabrics is on line! Bummer for me as I don't get to look at fabric until it comes in the mail. Thank you for your help.